The Responsible Investment Forum returns to New York for its third year to bring together the most sophisticated LPs, GPs and associations to discuss why, when, and how your firm should be implementing an effective ESG strategy. Qualified investors are eligible for a complimentary pass. Please contact zakira.r@peimedia.com for more information. PEI's Responsible Investment Forum brought together an impressive collection of the world's leading thinkers and practitioners on considering ESG factors in private equity investing. If you are serious about integrating ESG into your investment strategy, you should attend this conference. Excellent topics. High quality and diverse range of speakers. The PEI Responsible Investment Forum featured tightly choreographed programming, deep sector knowledge, and a high standard of event/venue comforts. It was absolutely a worthwhile learning and networking experience. A great Forum to understand where ESG trends are going. 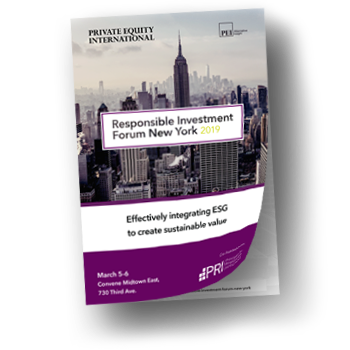 The sustainable private equity forum hosted by PEI and UN PRI is a positive milestone indicating that incorporating social and environmental metrics to screen and diligence deals will only lead to better risk-adjusted returns. A first-rate conference. Strong content, speakers, networking opportunities and very professionally run. Great event brainstorming and getting feedback from peers!